Hydralada Company supplies the full range of high tech machinery for the vineyard and winery, and leads the way in innovation and technology. Winery sorting tables with precision camera visionic systems, to grape crushers and de-stemmers, vibrating tables and discharge conveyors, this is our specialised field. The Gulfstream guarantees controlled and effective heat treatment of your grapes. The immersion principle gives instant and consistent results while preserving the quality of the harvest. The innovative thermovinification process significantly improves the quality of the wines and adapts the type of wine to consumer requests. Helps stabilise colour and aromas. The new Smart Press range of pneumatic presses meet the needs of the most demanding winemakers. These presses are equipped with the latest technology. The Fast Press drainage grids and the smart pressing system allow optimal use of the press to extract high quality juices. Both belt and vibrating sorting tables are available for hand sorting berries. These machines are designed to handle both whole or de-stemmed grapes, allowing easy sorting to ensure only high quality berries reach the winery. Manufactured in stainless steel, the Hydralada Elevator is available in several configurations to suit most applications. This will carry grape bunches, de-stemmed grapes or fermented pressed grapes, with zero waste. The Hydralada receival trailers gently transport grapes to the winery. They discharge the berries using high frequency vibration for consistent distribution, eliminating the need of augers. 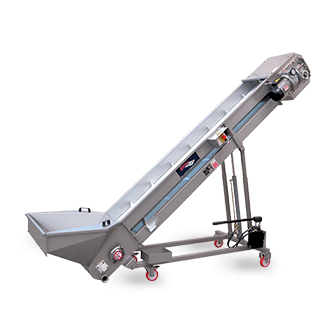 The preferred alternative to the more common auger system, the Sthik Vibrating Hopper has a specially designed receival bin that delivers the grapes over a vibrating table for a consistant feed and minimal fruit disturbance. No berry maceration. Visionic berry-by-berry sorting removes unwanted elements using high technology camera equipment. Removes green waste, foreign bodies and under-ripe or unhealthy berries, delivering a near perfect sample. High-frequency de-stemming combined with roller sorting table enables the Selectiv' Process Winery Sorter to gently de-stem and separate all green waste from the harvest. This new crushing concept allows optimum opening of the berries based on their maturity, resulting in better extraction of juices, polyphenols and aromatic compounds. Flow rates of up to 25 tonnes per hour.